The Romanesco broccoli. A Veg Oddity. I remember the first time I ever saw a Romanesco Broccoli. It was in Denis Healy’s stall in the Temple Bar Food Market a few years back. I had no idea what it was but was certain I had never seen such a curiously dazzling vegetable. Perhaps it was the perfection of its fractal florets that stopped me from hacking away at one and throwing it in the oven. It just wouldn’t be right without having a suitably respectful recipe to treat it kindly with. But that was before my little love affair with roasting cauliflower and broccoli began. For, you see, the Romanesco broccoli (also known as the Roman cauliflower) is sort of like broccoli and cauliflower’s cousin from outer space. It’s closer in taste and texture to the cauliflower, which means that it works beautifully in cheesy cauliflower style gratins or with pasta coated in Parmesan. 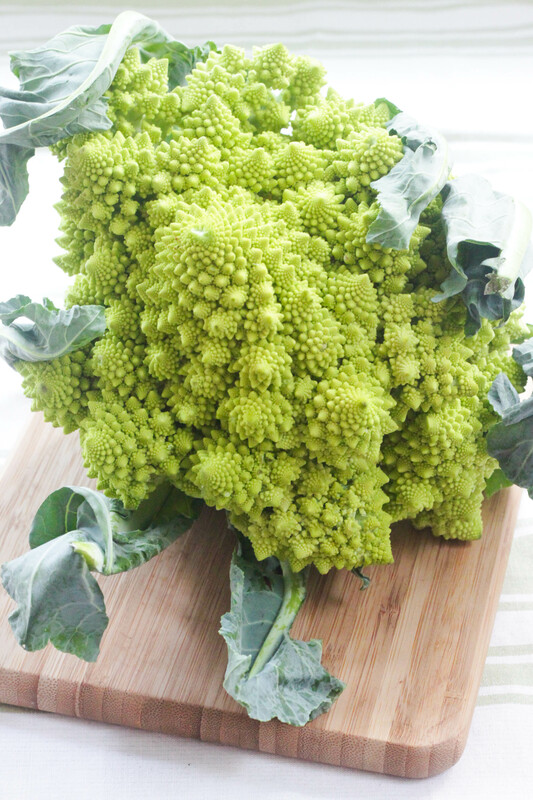 When I saw a Romanesco peeping out of my Home Organics bag this week, I took to the internet for more inspiration to make my inaugural cooking of this beautiful brassica extra special. This recipe for mackerel with cauliflower and caper salad caught my eye, which I thought would work well adapted to suit the Romanesco. I stuck with the mackerel but whizzed up a salsa verde to drizzle over the lot. The result was an almost devastatingly simple yet tasty supper. Salsa verde comes in a few different forms – although perhaps we can assume it’s always green. Some make it using a mixture of parsley, mint and basil, but traditionally the sauce gets its greenness from parsley. That’s all I had in the fridge which is why my recipe below only has parsley. I have made Jamie Oliver’s salsa verde using mint and basil in the past and it’s lovely, great with fish or served as an accompaniment for something sweetish like goulash. It might seem crazy to have two heads of brassicas between two people but, trust me, they’re so good roasted you’ll want to eat more. Start by heating your oven to 220C/200C fan/Gas Mark 7. 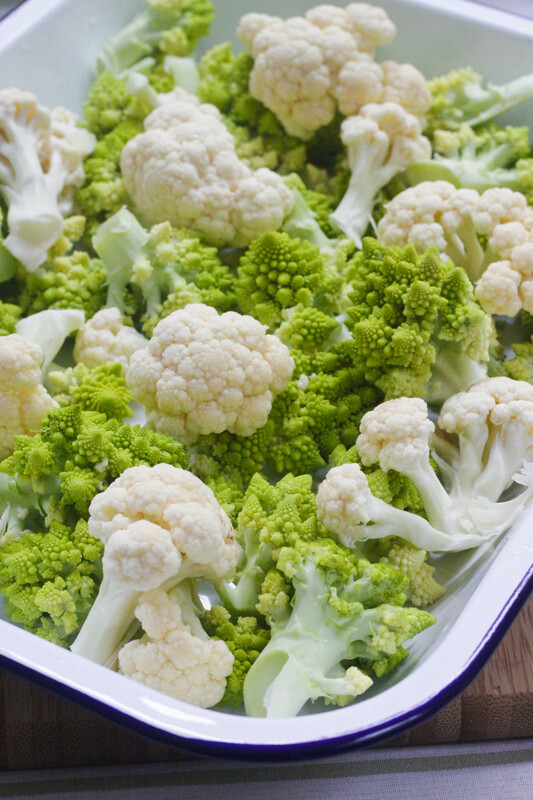 Cut your Romanesco and cauliflower into florets and give them a rinse under the tap. Put them into a large roasting dish and season generously with salt and pepper. Drizzle with a good bit of olive oil – probably 2 to 3 tablespoons – and pop the lot into the oven and roast for 20 to 25 minutes, until they’re lovely and crispy. Give them a shake halfway through so that the florets get evenly browned. While your vegetables are roasting, you can make the salsa verde. 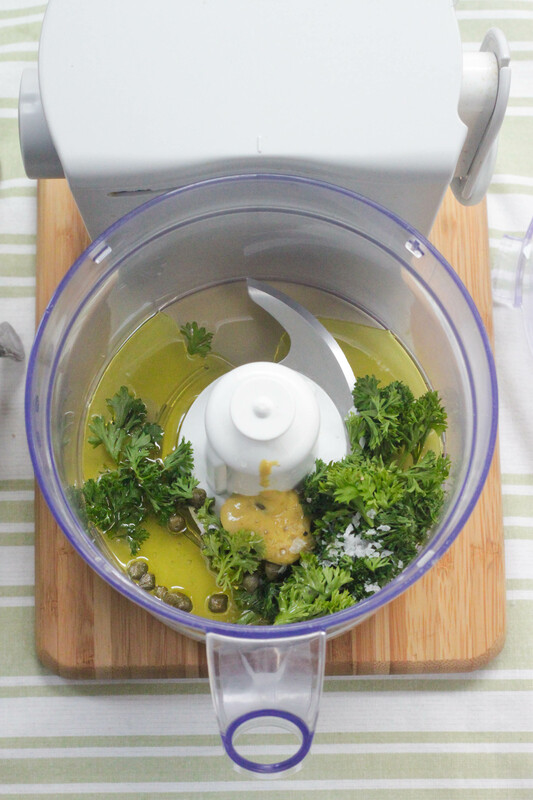 Pick the leaves from the bunch of parsley and add to your food processor bowl. 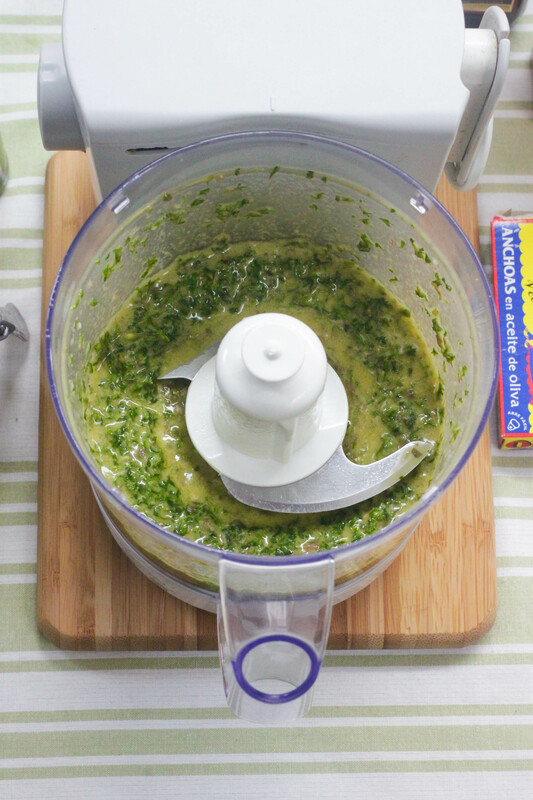 Peel the garlic clove and finely grate it into the food processor bowl along with the parsley. Add the capers, mustard, anchovies, red wine vinegar, olive oil and lemon juice and whizz it until you have a finely blended sauce. Add a pinch of salt and pepper and whizz again. Give it a taste – don’t worry, it’s supposed to be acidic! It will be balanced out by the smoked fish and the crunchy vegetables, promise. When your Romanesco and cauliflower are nearly done, add the smoked mackerel to the oven in a smaller roasting dish, to warm through. This will take 5 minutes. 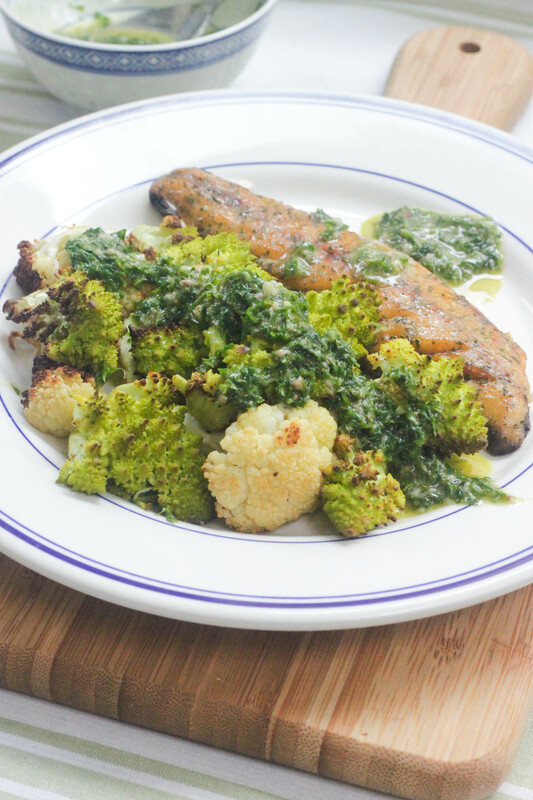 Serve your fish and roasted Romanesco and cauliflower with a generous drizzling of the salsa verde over the top. And some extra sauce on the side. The result should be a tangy, smokey, crunchy supper. I’m not a nutritionist, but I’d say it’s pretty gosh-darned healthy too. Full of space vitamins. 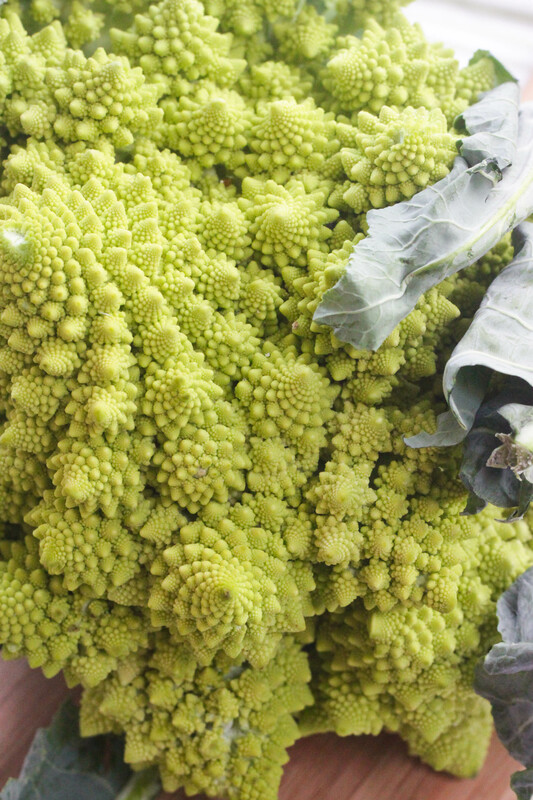 You should be able to find Romanesco broccoli in your local farmer’s market or fancy food shop. As I was discussing with my friend Elle, I’d say kids would get a real kick out of it. You can tell them it grows on the moon. Might make them more open to eating it. Mwah mwah mwah! Although the Romanesco is from earth, it is most certainly an oddity. Not unlike David Bowie. I think you could put Salsa Verde on anything and it would taste great. I love Romanesco. We attempted to grow it last year and got one or two lovely dinners out of it but the hens LOVED it more and they ended up shredding the plant and eating it all. We let them. This year, there will be a big(ger) fence. I’d have to concur about salsa verde – I love its crazy vinegariness! So cute that your bold hens got a hold of the romanesco. Hope this year’s brassicas survive! PHOAR! I’m definitely definitely making this. Looks UH-mazing. Thanks, Ben! Let me know how you get on with it. Hope you like it as much as we did! Thanks Colette! I love smoked mackerel. Was really pleased how this flavour combination worked so I hope you like it too if you try it! Brilliant photo. It looks like flock wallpaper turned into a vegetable. Thanks Conor! It’s the most amazing looking thing, isn’t it? So gorgeous. I am totally having visions of you threatening to stir fry this in your wok. Quick, tasty and healthy dinners are the best! Heh heh! IMMA GONNA STIR FRY YOU!! I always buy romanesco cauliflowers when I see them because I think they look like aliens TOO.